First of all, when we say free range chickens we have a very different meaning compared to the word free range when used to describe commercial chicken product production methods. 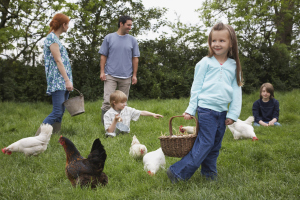 For us, with backyard flocks or small farms, when we say ‘free range’ we mean letting our chickens out in the yard or field. Basically, letting them loose to walk about and forage at will. 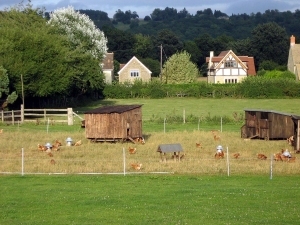 This is the ideal farm setting – hens meandering about pecking and scratching in the sun. 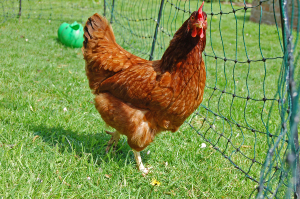 This freedom is wonderful for your hens – they get a full diverse diet, sunlight, exercise. They get to do what makes them happy – fulfill their needs and desires – make choices. They will find a spot to take dust baths to clean themselves of mites and parasites. They will seek out shade in the heat of the day, cover during a rainstorm, and lay down and stretch out their wings on a sunny hillside on a cool morning. They will also seriously deplete the number of ticks in your yard. Their eggs will be more nutritious, with more balanced fats and nutrients, and deep orange-yellow yolks. Well, it all seems like a winning situation, until a neighborhood dog wanders into your yard, or a mother fox shows up with a den of cubs to feed, or a hawk decides to swoop in. Your free-ranging chickens are vulnerable to these predators and more. And over time, even with the best watchfulness, fences, and gates, you will lose at least some of your birds to these forces. What Can You Do to Protect Free-Range Chickens from Predators? It depends on your property and situation and how much you want to invest. Probably the best course of action is to compromise – that way you’ll have the fewest losses of chickens and still have the benefits of free-ranging. The first thing you should initiate is a chicken curfew. The highest percentage of chicken-eating predators come out after dark. Construct your coop to be predator proof and to fully and completely lock up. Be careful to avoid even small holes as weasels and minks can slip through a 2 inch by 1 inch space with ease. When you first get chickens or first take your chicks out of the brooder, put them into your coop and don’t allow them to free range for a couple weeks. You want to establish the habit of being inside that coop during the night. Once you start letting them out during the day, they should naturally gravitate inside every night at dusk. 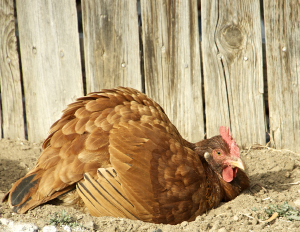 It is a very natural instinct for your chickens to look for a safe roosting spot at nighttime. They like to be up high too – so make sure your coop has an elevated roost. If you still have trouble with your chickens not naturally going into the coop at dark, try training them using some sort of treat. Go out just before dusk, and get your chickens attention and then place the treat inside the coop. Once they all go in, shut the door for the night. You’ll have to be diligent with this and do it for about 2-3 weeks until you can trust that they will all go in without a treat. Most chickens have no issues learning to go into their coop each evening. If you are conscientious about closing the door and locking them safely in each night, you will cut back on losses from predation by at least 85%. But even doing that step, you will still have some issues with daytime predators. Normal perimeter fencing like a post and rail with wire on it can really help against neighborhood dogs, but foxes and hawks aren’t thwarted at all by a perimeter fence. Constructing a chicken run or paddock attached to your coop that is either covered or really tall (6-8 feet high) and that goes into the ground about 1 foot would be extremely helpful against these predators. The run will allow you to still let your chickens out of the coop, but be in a protected outside space. The size of the run would depend on the number of chickens you have, how much time they will be spending in the run, and how much money you want to spend. The run doesn’t have to be really big – you can use it only in certain situations, and let the chickens free range in the full yard most of the time. Hawks and foxes tend to be seasonal. And they tend to give up easily. If a fox gets one of your chickens in the full yard one day, keep them closed up in the run for the following week. The fox will usually decide it is not worth coming by anymore, and you can let your chickens out into the yard again. Hawks are often not even after your chickens. They are looking for rodents that they know are near chickens. Providing areas around your yard’s perimeter like scrubs or lean to’s of some sort, where the chickens can run and hide from the hawk really works. It works especially well if you have a rooster. Roosters tend to watch the sky specifically for hawks and give out an early warning cry to the hens to run for the shelters. Or if you have a lot of daytime predator pressure, keep your chickens in the run most of the time, but when you are outside with them, then let them into the full yard. 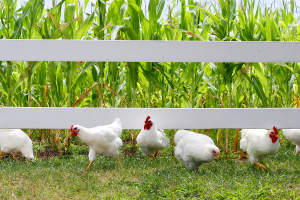 Your chickens would still get the benefit of free-ranging but with far reduced risk. The rewards of free-ranging your chickens are so high both for you and for your chickens. You just need to take some precautions to lower the risks. But I think that chickens would prefer a life spent foraging and being free, even if it is shorter than a long life spent cooped up every day. Just make sure you are balancing the freedom with a responsible amount of safety. Want to learn more about raising free-range chickens? Check out these books for sale on Purely Poultry.